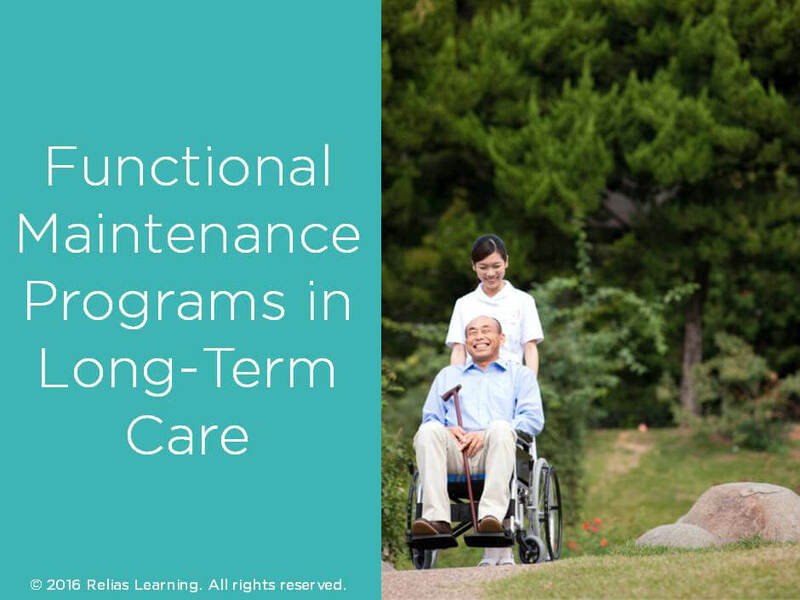 Designing and maintaining functional maintenance programs (FMPs) is necessary, valuable, and perhaps under-utilized for the long-term care population. In this course, you will learn about the factors that need to be considered regarding FMPs; you will then be able to use this information to tailor your own process for managing the continuity of rehab programs. Disclosures: Polly Warring MSPT, has no relevant financial or nonfinancial relationships to disclose. List four goals of functional maintenance programs. Identify three government policy and regulatory components as they relate to reimbursement of functional maintenance programs in the long-term care setting. Identify three qualifications of appropriate residents. Document training, outcome, and necessary follow-up for a given case study. Polly Warring, MSPT is a physical therapist who has worked in the physical therapy field since 1992. During her time in the physical therapy field, she has worked in a variety of settings including outpatient, acute care, skilled nursing, and specialized programs for children with ADHD. She received a Bachelor of Science Degree in Biomedical Science from Texas A&M University in 1990 and graduated with a Master of Science Degree in Physical Therapy from Texas Woman's University in Houston in 1997. While there, she was part of a research team that published an abstract in the May, 1997 edition of the Physical Therapy Journal: "Quantification of EMG Activity from Five Muscles in Comparison of Four Methods of Rising from Sitting". She has worked primarily in the adult orthopedic outpatient field since that time, but has a great deal of clinical experience evaluating and treating geriatric patients to improve their quality of life. Disclosure: Polly Warring, MSPT has declared that no conflict of interest, Relevant Financial Relationship or Relevant Non-Financial Relationship exists. The target audience for this course is: entry level Occupational Therapists; entry level Physical Therapists; intermediate level Speech and Language Pathologists; in the following settings: Post-Acute Care, Rehabilitation Settings.